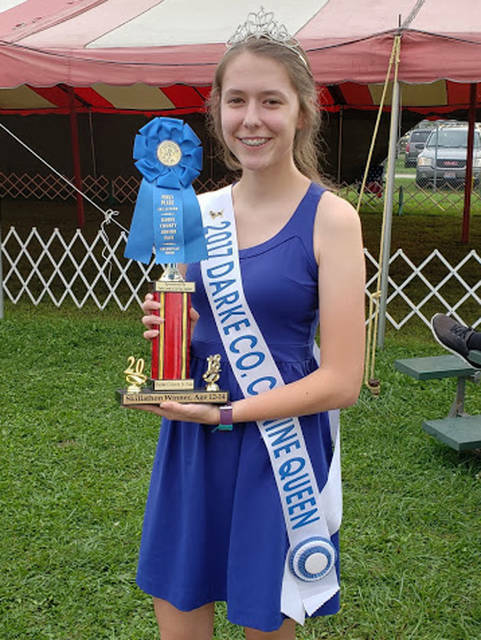 Kimberly Winner showed in the area of beef at the Darke County Fair. She was reserve grand champion and outstanding exhibitor with her steer. She was also fifth place overall with her steer, second place in Skillathon and was fourth place in showmanship. Versailles FFA member Cory Timmerman showed in the area of goats. He was named the grand champion dairy market wether. 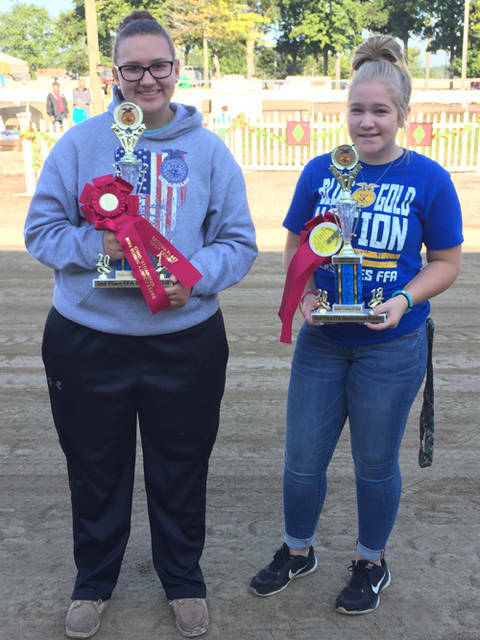 At the Darke County Fair, the Versailles FFA competed in the general livestock judging contest. The team was named overall high team in the senior division. Members who competed in this contest included (back row, l-r) Kimberly Winner, Kayla Bohman, (front row, l-r) Marcus Berger, Emma Peters, Ben Albers, Ian Gehret and Alex Kaiser. 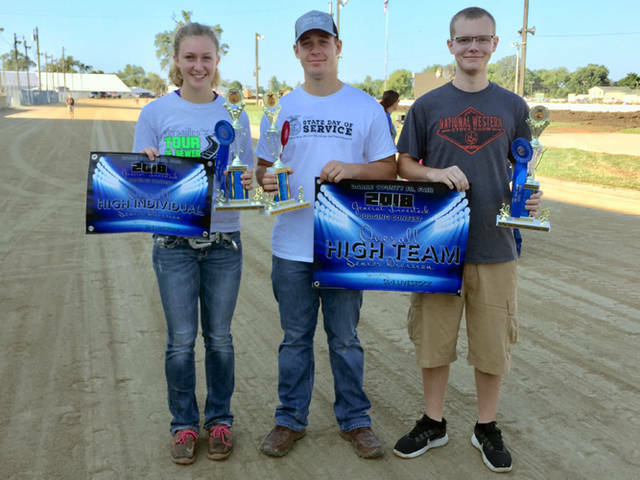 Versailles FFA members who were a part of the highest scoring first place general livestock judging team at the Darke County Fair included (l-r) Emma Peters, Ben Albers, Marcus Berger and Ian Gehret (not pictured). Emma Peters also placed first as an individual. FFA members (l-r) Laura Wuebker and Paige Gasson both placed overall with their shop and crop. Laura Wuebker was reserve champion in the area of crop exhibits, and Paige Gasson was reserve champion in the area of horticulture exhibits. 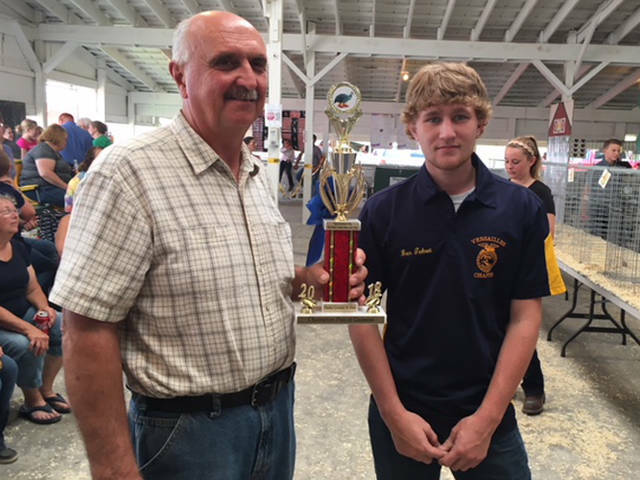 Ian Gehret was recognized as the Junior Beef Herdsman in the Junior Fair Beef Department. 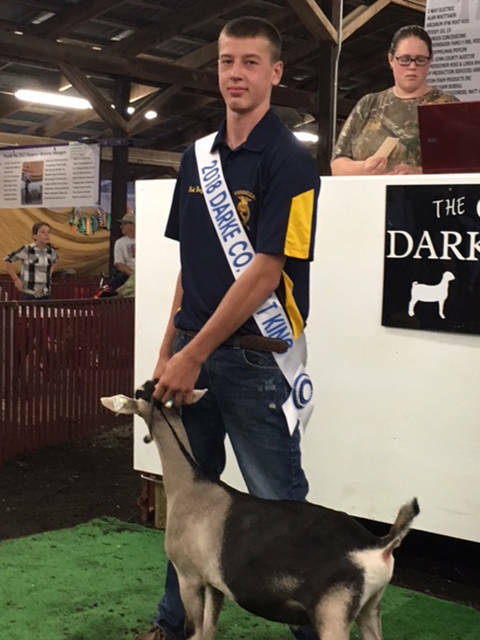 Ben Gehret exhibited the grand champion guinea at the 2018 Darke County Fair through Versailles FFA. Evan Rammel was best of breed checkered giant, 10th place single fryer and ninth place pen of three. 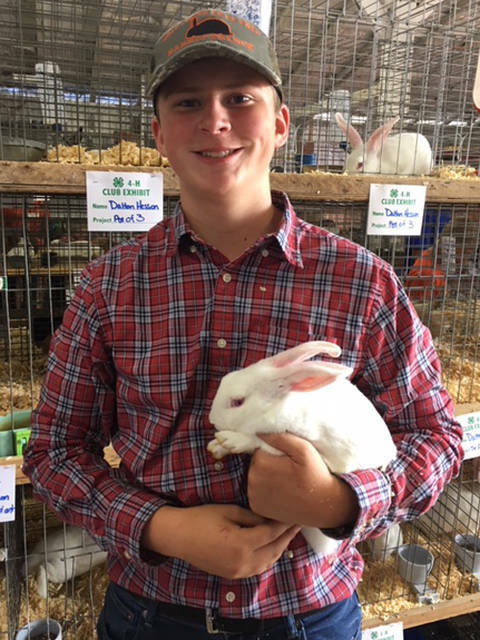 Dalton Hesson showed rabbits at the Darke County Fair through the Versailles FFA. He was named the showman of the Rabbit Barn along with rabbit king. He also placed first at Skillathon, best of breed Flemish giant and English lop. At the Darke County fair, the Versailles FFA competed in the dairy judging contest. Members who competed included (back row, l-r) Caden Buschur, Noah Gilmore, Garrett Toops, (front row, l-r) Shelbie Schmitmeyer, Laura Wuebker and Renea Schmitmeyer. 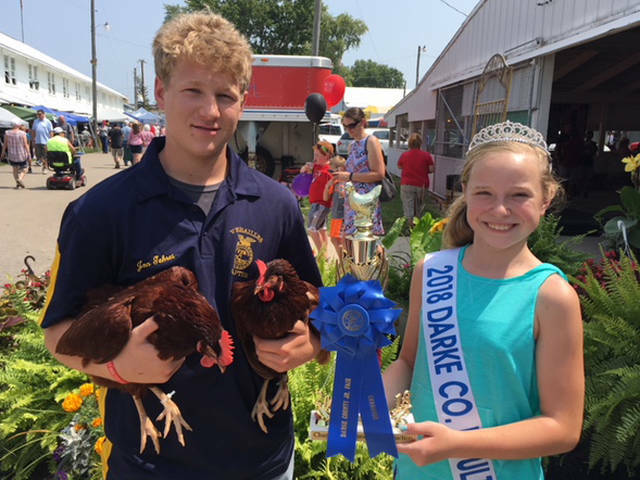 Versailles FFA member Jon Gehret competed in the area of Poultry at the Darke County Fair. He earned grand commercial production and reserve grand champion overall meat/Commercial entry. FFA member Greg Bohman exhibited livestock in the area of dairy cattle. He placed first overall in showmanship. FFA member Renea Schmitmeyer showed in the area of dairy cattle. She placed second in middle weight feeder and second place in the Breeding Skillathon. Versailles FFA member Laura Wuebker competed in the area of dairy cattle and was named the lightweight champion in open class. She also placed first in Skillathon. Emma Peters was named the champion division 1 market lamb, reserve champion southdown ewe, champion southdown ram and was first place in 15-year-old showmanship. Versailles FFA member Noah Barga competed in the area of goats and was named the goat king. Deanna Hesson was overall purebred champion and overall purebred reserve champion. FFA member Jacob Wuebker competed in the area of dairy cattle. He was named the outstanding market exhibitor as well as placing second with both his dairy steer and dairy feeder. 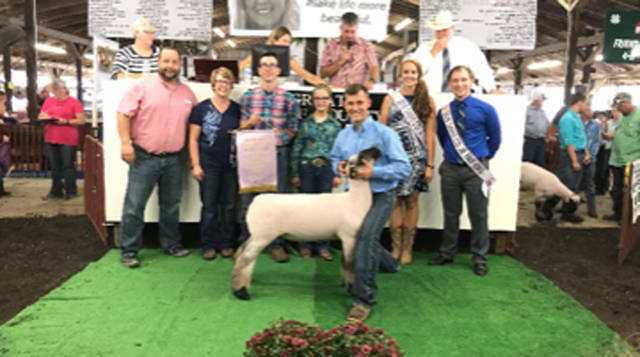 FFA member Isaac Gehret showed in the area of market lamb. He was named reserve grand champion and grand champion market lamb. He is shown with his family and parents, Jill and Gary Gehret. At the Darke County Fair, Lewis Winner showed in the area of beef. 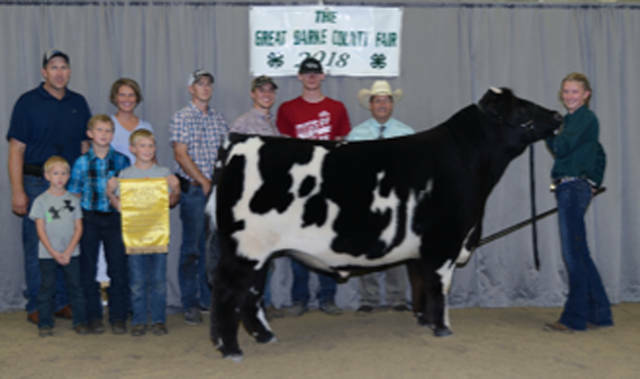 He exhibited the grand champion market steer in the Junior Fair and placed third in showmanship. He is shown with his family and parents, Brian and Lisa Winner. 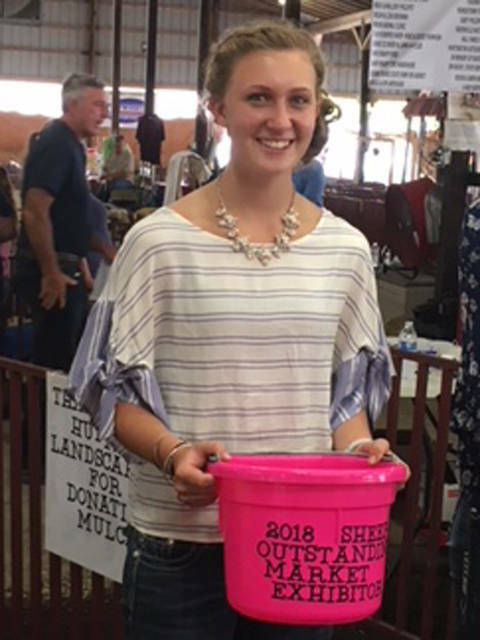 Kennedy Hughes had many accomplishments in the Dog Barn including first in intermediate Skillathon, first place in novice A obedience, second place in intermediate B showmanship and was gold medal rally novice B.
VERSAILLES – Versailles FFA members were busy over the summer getting ready to participate and compete in the Great Darke County Fair. On Aug. 16 students were able to bring in their vegetables, crops and shop projects. Shop and crop consists of bringing in various vegetables from the students’ garden as well as wood work items, welding items and grains for livestock. The Versailles FFA had many members bring in shop and crop, and Versailles had the most of any FFA Chapter in Darke County. 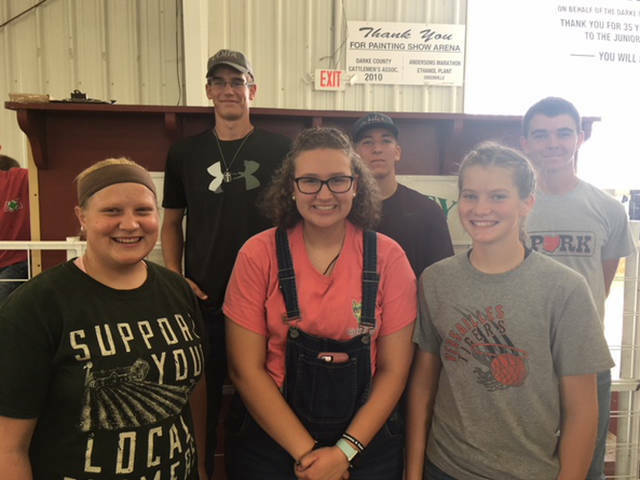 Versailles FFA members who exhibited shop and crop included Ben Albers, Delaney Barga, Anna Barlage, David Barlage, Cayla Batten, Courtney Batten, Marcus Berger, Justin Besecker, Darren Billenstein, Luke Billenstein, Kayla Bohman, Brandon Bradley, Caden Buschur, Sara Cavin, Emily Delzeith, Asa Demange, Brad Didier, Greg Dirksen, Kobe Epperly, Emma Gasson, Paige Gasson, Ian Gehret, Isaac Gehret, Owen Gehret, Elliot George, Elise George, Emma George, Toby George, Wesley George, Melissa Gigandet, Isaac Gilmore, Noah Gilmore, Sam Gilmore, Damien Grilliot, Isaac Grilliot, Lydia Grilliot, Xavier Grilliot, Jayden Groff, Nathan Grogean, Phillip Grogean, Jamie Hart, Sarah Hart, Andrew Heckman, Caleb Heitkamp, Maddy Henry, Sarah Hess, Jacobi Hoelscher, Jaimee Hoelscher, Trevor Huber, Kennedy Hughes, Evan Keller, Aaron Knapke, Katelyn Knapke, Sarah Kremer, Trent Langenkamp, Caitlyn Luthman, Carter Luthman, Cole Luthman, Jessica Lyme, Kylie Lyons, Marcus Marshal, Lizzy May, Troy May, Brianna Nieport, Cassie Parsons, Emma Peters, Dawson Petitjean Cress, Abby Petitjean, Ashley Petitjean, Autumn Petitjean, Laney Petitjean, Paige Platfoot, PJ Platfoot, Kyle Pothast, Renea Schmitmeyer, Shelbie Schmitmeyer, Levi Sherman, Ashley Shimp, Noah Shimp, Jason Simons, Haley Smith, Garrett Thompson, Austin Timmerman, Joel Turpen, Tessa Tyo, Faith Wilker, Bailey Wilson, Kimberly Winner, Lewis Winner, Luke Winner, Jacob Wuebker, Laura Wuebker and Tori Wuebker. Individual placements within shop and crop included: Ben Albers placed third with his zucchini; Courtney Batten placed third for her sunflowers; Kayla Bohman placed third with broccoli, first brussel sprouts, second tomatoes, third for onions and third for miscellaneous vegetables; Caden Buschur placed second in sunflowers, third hot peppers and second for corn silage; Emily Delzeith placed second tomatoes and first for her floral arrangement; Asa DeMange placed second for brown eggs and third for brussel sprouts; Greg Dirksen placed first for gourds; Kobe Epperly placed third for his carrots; Emma Gasson placed second for beets and second for watermelon; Paige Gasson placed first for her pumpkins and first for miscellaneous vegetables; Ian Gehret was second for rope halter; Owen Gehret was first for pumpkins; Elliot George was first for hay mix; Elise George was second for her wood project and second for flowerbox; Emma George was first for sweet corn, first for cabbage, first for hay timothy and third for pumpkins; Toby George was second for SAE research trifold display; Wesley George placed second for pumpkins, third for cabbage, third for hay timothy and third for hay clover; Noah Gilmore placed first for miscellaneous crops and first for wood project; Damien Grilliot placed first for tomatoes and first for sweet pepper; Jayden Groff placed third for mixed plate of apples, first for shop creeper, first for grapes and third for white eggs; Nathan Grogean was third for SAE display, third for grapes and second for honey display; Phillip Grogean was first for honey display, third for sweet pepper and second for berries; Sarah Hart was first for brown eggs; Caleb Heitkamp was first for tomatoes, third for brown eggs and third for plum tomatoes; Maddy Henry was first for eggplants and first for sunflowers; Sarah Hess was second for potatoes; Trevor Huber was second for hay mixed; Aaron Knapke was third for SAE display; Katelyn Knapke placed third for tomatoes; Caitlyn Luthman was second for soybeans and first for white eggs; Carter Luthman was second for brussel sprouts, second for onions, first for squash and third for gourds; Cole Luthman was second for white eggs, third for soybeans and first for electric light stand; Jessica Lyme was third for beets; Lizzy May placed second for hay timothy and first for hay clover; Troy May placed second for hay clover; Breanna Nieport was second for cabbage; Cassie Parsons was second for SAE display; Kyle Pothast was third for his cucumbers; Renea Schmitmeyer placed first for corn silage, second for haylage and second for miscellaneous; Shelbie Schmitmeyer was first for haylage, third for miscellaneous and third for corn silage; Noah Shimp was first for zucchini; Faith Wilker placed second for floral arrangement and third for tomatoes; Lewis Winner was third for watermelon; Laura Wuebker was first for soybeans, first for wheat and won reserve champion crop for her soybeans; and Tori Wuebker was second for grapes and third for tomatoes. However, members did not only have the chance to show shop and crop, they also had the opportunity to show livestock. Members from the Versailles FFA Chapter exhibited chickens, turkey, dairy cattle, goats, dogs, rabbits, sheep, steer and swine. In the area of poultry, Versailles FFA members who exhibited included Ben Gehret, Evan Keller, and Jon Gehret. Jon Gehret earned grand commercial production and reserve overall meat entry. Ben Gehret was named as the champion guinea. In the area of beef, Versailles FFA members who exhibited included: Kimberly Winner, Luke Winner, Troy May, Austin Nerderman, Ian Gehret, Lewis Winner and Lizzy May. Kimberly Winner was reserve grand champion in open show, fifth place overall in junior show with her market steer, fourth overall in showmanship, champion in senior division in showmanship, second place in Skillathon and was the outstanding exhibitor with her steer. Luke Winner placed fourth in intermediate showmanship and third overall in Junior Fair. Troy May placed third in the Division 6 market, and Austin Nerderman earned the champion rate of grain steer. 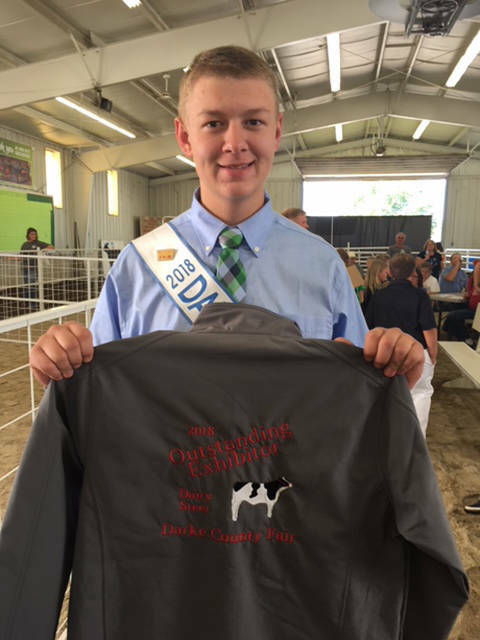 Ian Gehret was named the Junior Fair beef herdsman. Lewis Winner won grand champion market steer in the junior show and was third place overall in showmanship. Lizzy May placed second in her division and was sixth place overall. 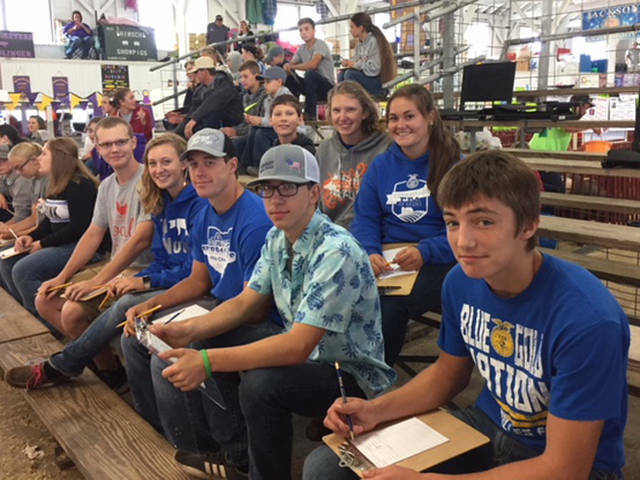 In the area of dairy cattle and dairy steers, Versailles FFA members who exhibited included: Shelbie Schmitmeyer, Jacob Wuebker, Tyler Dirksen, Greg Bohman, Tori Wuebker, Renea Schmitmeyer, Caleb Heitkamp, Anna Barlage and Laura Wuebker. 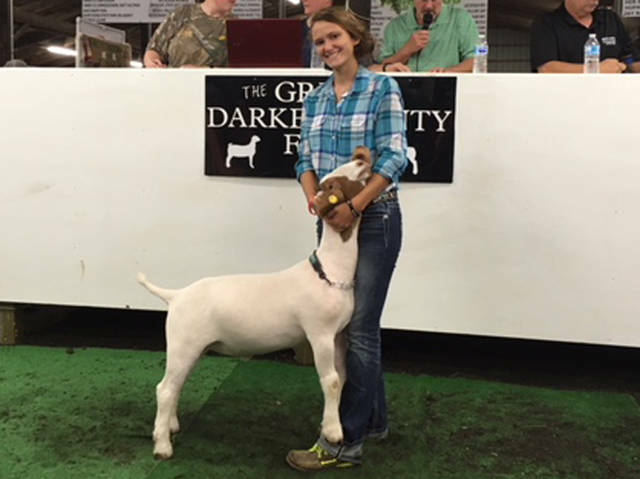 Shelbie Schmitmeyer placed fifth in Skillathon, first place in fall yearling class and fourth place in showmanship. 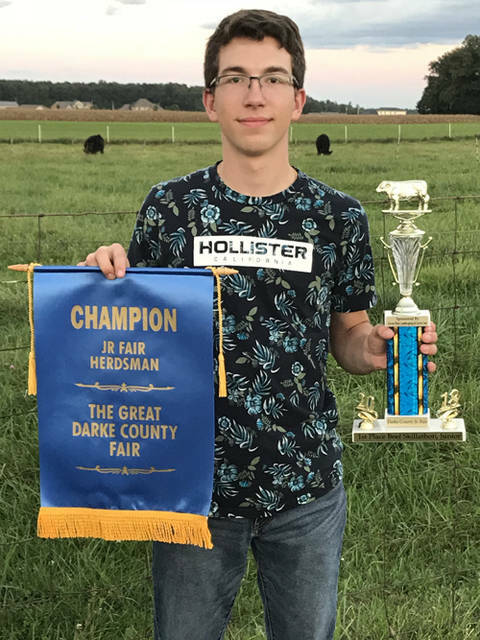 Jacob Wuebker placed first in the 16-year-old showmanship, had the second place dairy steer, second place dairy feeder, was first place in Skillathon and was the outstanding market exhibitor in dairy. 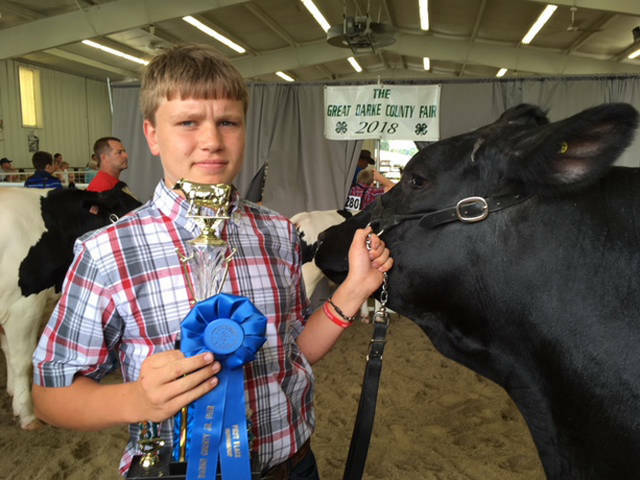 Tyler Dirksen placed fourth in the 13-year-old showmanship, fourth place with his dairy steer and second place in showmanship. Renea Schmitmeyer placed fourth in showmanship, second place in Breeding Skillathon, first place in the dairy judging contest, third place in Market Skillathon and was second place middle weight feeder. Caleb Heitkamp placed second and third with his dairy feeder, fourth place in showmanship and third place with his dairy steers. 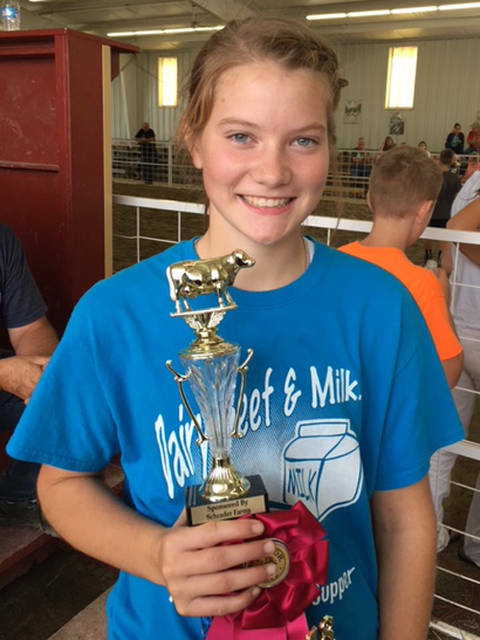 Anna Barlage earned sixth place with her dairy steer and fourth place in the Dairy Market Skillathon. Laura Wuebker was the lightweight champion in open class, first place Skillathon and second place showmanship. In the area of goats, Versailles FFA members who exhibited included: Noah Barga, Deanna Hesson, Cory Timmerman, Brad Pohlman, Grant Pohlman and Delaney Barga. Noah Barga was senior champion in milking alpine and junior champion alpine. Deanna Hesson was overall purebred champion and overall purebred reserve champion. Delaney Barga placed third in showmanship and second in the grade senior doe division. Cory Timmerman was named grand champion dairy market wether, senior champion milking Oberhasli and champion percentage boer doe. 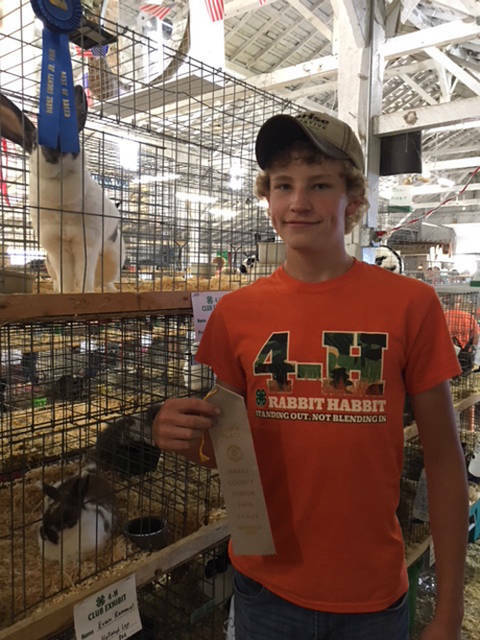 In the area of rabbits, Versailles FFA members who exhibited included: Kristopher Marshall, Evan Rammel, Kobe Epperly, Darian Feltz, Ethan Kaiser, Caleb Fraley, Dawson Petitjean Cress, Kane Epperly and Dalton Hesson. Kristopher Marshall placed sixth in showmanship. Evan Rammel was best of breed checkered giant, 10th place single fryer and ninth place pen of three. Kobe Epperly earned fourth place at Skillathon, ninth place single, sixth place pen of three and best opposite breed New Zealand. Dalton Hesson was reserve class 6 rabbit, first place intermediate Skillathon, showman of Rabbit Barn, fourth place Showman of Showmen, best of breed Flemish giant, best of breed English lop, sixth place single fryer and seventh place pen of three. Kane Epperly had ninth place single fryer. Versailles FFA member who exhibited in the area of dogs included: Kennedy Hughes. Kennedy Hughes placed first in Intermediate Skillathon, first place in novice A obedience, second place in intermediate B showmanship and was gold medal rally novice B. In the area of sheep, Versailles FFA members who exhibited included: Alex Kaiser, Caleb Kaiser, Cassie Parsons, Laney Petitjean, Cody Williams, Clay Bergman, Taran Tyo, Taylor Tyo, Issac Gehret and Emma Peters. Caleb Kaiser placed second in showmanship, and Alex Kaiser was second place in his market lamb class. Emma Peters was named the champion division 1 market lamb, reserve champion southdown ewe, champion southdown ram and was first place in 15-year-old showmanship. 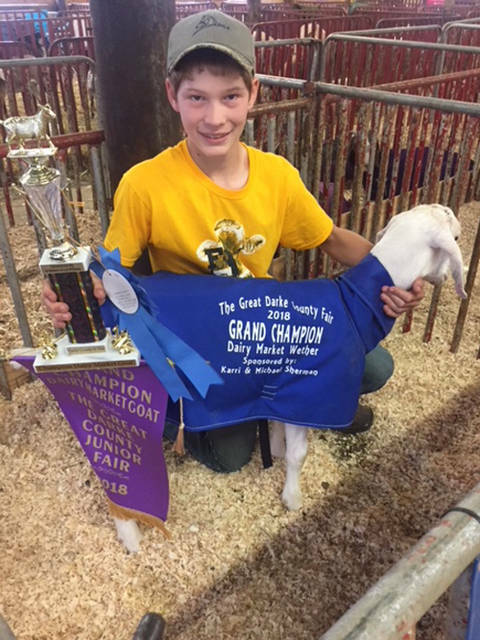 Issac Gehret exhibited the grand and reserve grand champion market lamb in the junior fair. In the area of swine, Versailles FFA members who exhibited included: Ben Albers, Taylor Tyo and Taran Tyo. Ben Albers was named the reserve champion Poland China. Also at the fair, the Versailles FFA had a general livestock judging team and a dairy judging team. Members of the general livestock judging team included: Marcus Berger, Emma Peters, Ben Albers, Ian Gehret, Kimberly Winner, Kayla Bohman and Alex Kaiser. Emma Peters was the first place individual in general livestock, and the team was the overall high team in senior division. The team consisting of Emma Peters, Marcus Berger, Ben Albers and Ian Gehret placed first in the contest. The dairy judging team consisted of: Shelbie Schmitmeyer, Caden Buschur, Laura Wuebker, Renea Schmitmeyer, Garrett Toops, Tori Wuebker and Noah Gilmore. 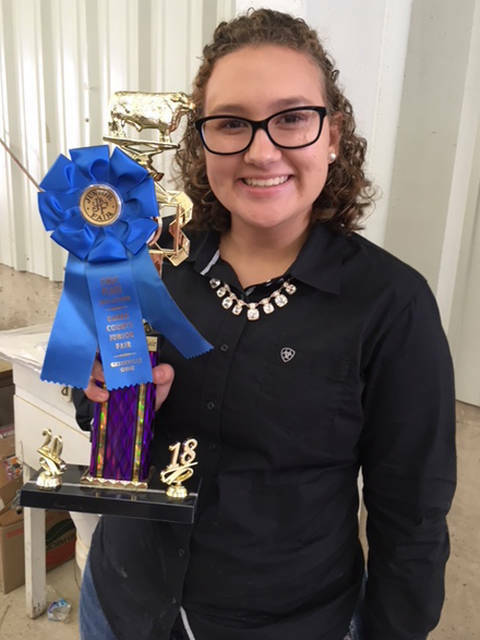 Renea Schmitmeyer was named first place individual in the dairy judging contest.